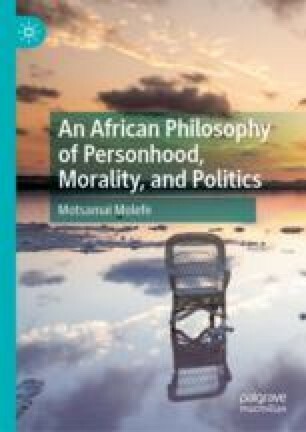 Molefe explores the meta-ethical debate regarding partiality and impartiality in African philosophy, focusing on the implications that personhood has for it. ‘Partiality’ defines morality as essentially accommodating favouritism while ‘impartiality’ defines it as essentially concerned with equality. Molefe’s focus is on whether morality—understood as an achievement of personhood—is best construed in terms of partiality of impartiality. He concludes that personhood entails the former, and that partialism can be further analysed into agent-related and other-centred partialism. The content of these positions is explained, before two criticisms to the idea that personhood entails partiality are addressed. Appiah, A. (1998). Ethical Systems, African. In E. Craig (Ed. ), Routledge Encyclopedia of Philosophy. Retrieved from http://www.rep.routledge.com.ujlink.uj.ac.za:80/article/Z008SECT5. Molefe, M. (2018). Personhood and Partialism in African Philosophy. African Studies. https://doi.org/10.1080/00020184.2018.1519337.